A masterpiece from master of Korean drama - Ki-duk Kim, which earned him many awards, including Best Director award at 2004 Venice International Film Festival and granted international recognition of his talent. After premier at said festival he received 15 minute long standing ovations from audience. 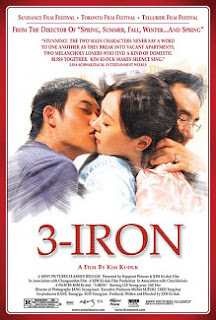 3-Iron (Bin-jip, "Empty House" as translated from Korean language) follows drifting youth Tae-suk (Hyun-kyoon Lee) who breaks into houses of other people while they are away, but instead of robbing them, he cleans up, washes clothes, repairs home appliances and so on. In a way he partakes in the lives of these people. One day house which he visits is not empty, he is being spotted by housewife Sun-hwa (Seung-yeon Lee). He leaves, only to return later on and witness abuse which she is subject to from her husband. A love story begins. Interesting thing about the movie is that the main character doesn't speak, but his performance of body language and mimics is astonishing and probably expresses much more than the words could possibly do. Watched this in june 2005 in my hometown. Never thought I would visit korea in life. But m writing this sitting in the korea, It reminded the great pleasures this movie has given me. no words are required to describe its beauty. Kim Ki Duck Train's beaut piece!! Please include Kim's The Isle in this list too. It was intense and peculiar.